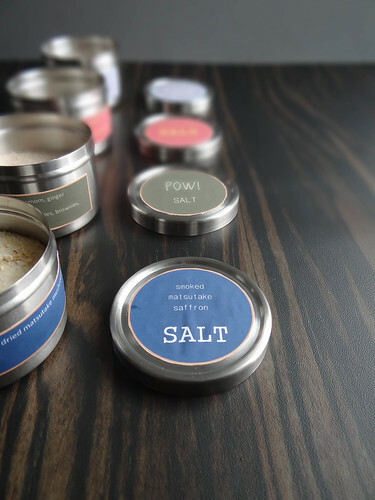 I am a huge fan of finishing salts - truthfully I love any unique salt. 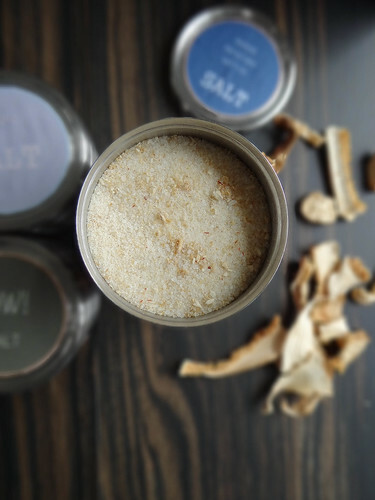 Salt can bring out the best in a dish, elevating the flavors to the next level. I have a home arsenal of salts - they have their own dedicated shelf in the spice cabinet. 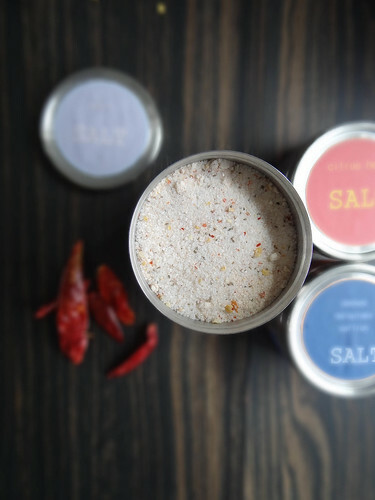 Gourmet salts can be a bit pricey, I thought it was about time that I start making my own. 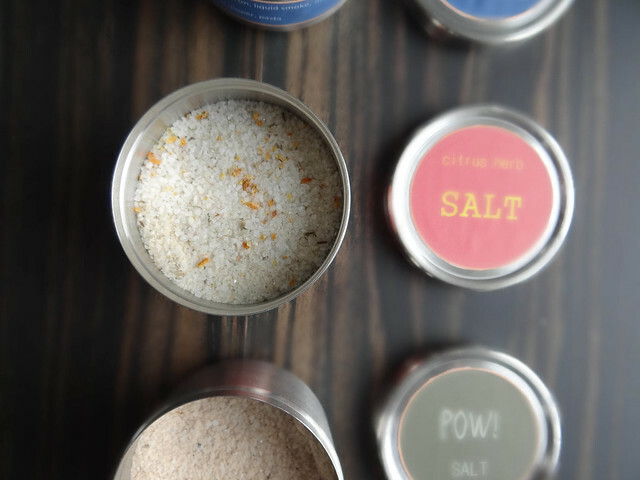 Not only are they super easy, making your own gourmet salts is economical and allows you to experiment with different flavor combos that are unique. 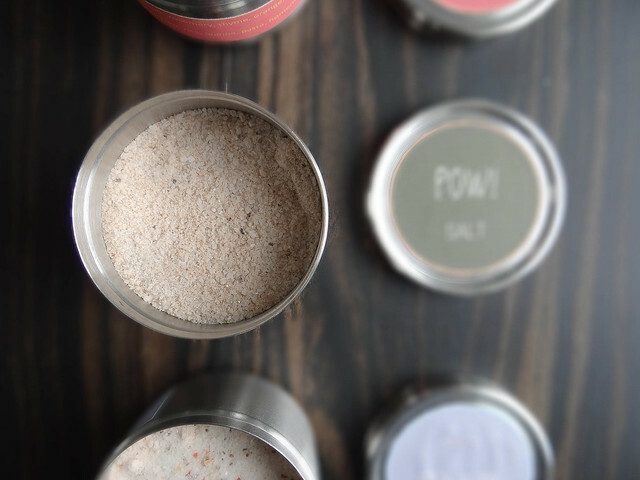 Welcome to number 2 in the DIY series: make your own flavored salts. If you missed last week- check out the first in the series here! 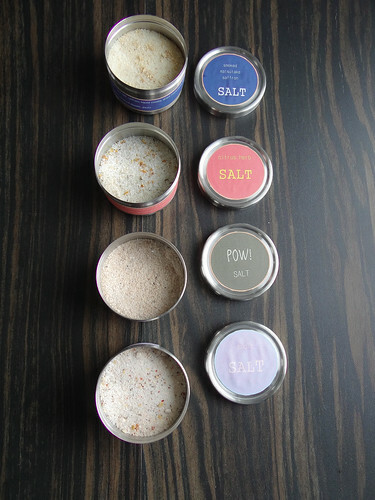 The flavor combinations that I chose for my first DIY salt collection range from savory to sweet. The ingredients are ones that I have on hand at all time, so creating a batch of salt at a moments notice is easy, so lets get started! Magic salt, brings out the best in every dish. 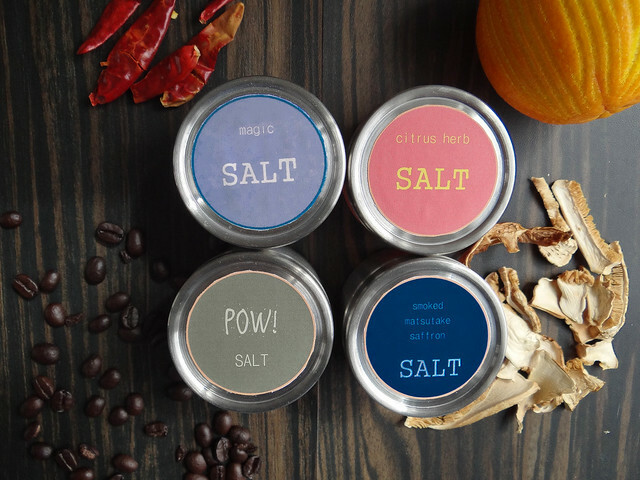 Nooch (nutritional yeast), dried garlic, dried jalapeno, sweet paprika & celery seed are the ingredients found in Magic salt. 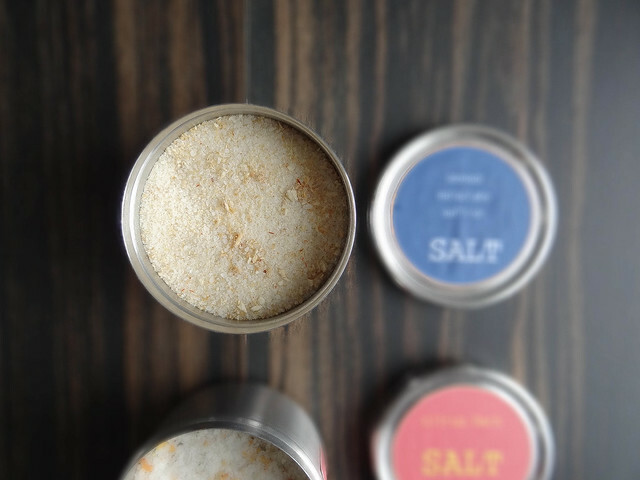 This type of salt is fun to play around with- sub in sweet paprika for smoked, try a dried chipotle pepper instead of a jalapeno, try dried onion instead of garlic- you get the idea. POW! 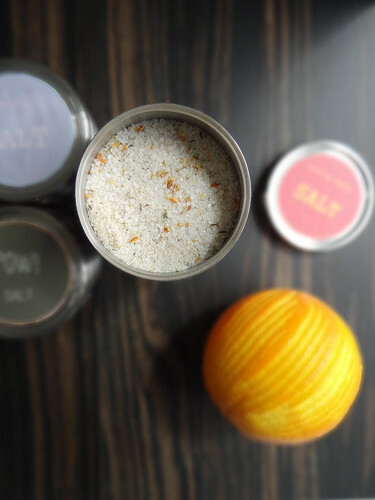 Salt is the perfect salt to use with your sweets or as a cocktail rimmer. Made with coffee beans, ginger, cardamom & cinnamon - sure to be a winner when sprinkled over dark chocolate. 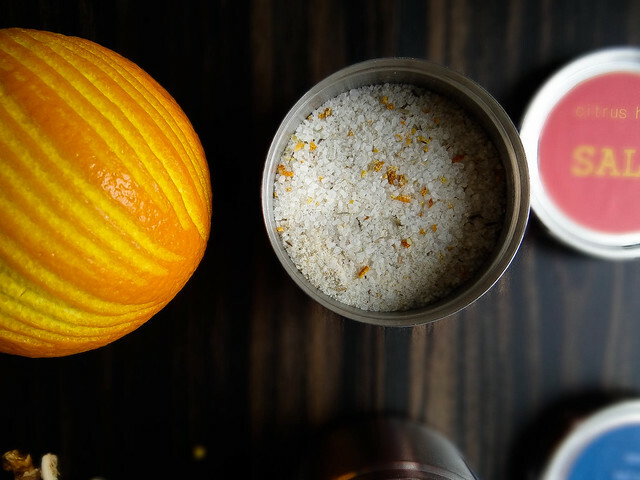 Citrus Herb is a classic salt- no pantry should be without it. Smoked Matsutake & Saffron Salt is the elegant salt of the bunch - awesome in risottos, sprinkled over pasta with olive oil & garlic with a bit of crushed red pepper or as a simple olive oil dipper. Any dried mushroom can be used in place of the matsutake- porcini would be an amazing sub in. 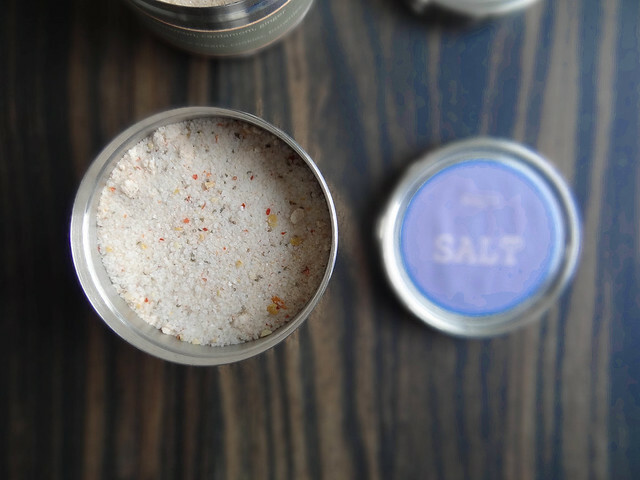 Once you have made the salts, they can be stored in any airtight container - mason jars or any re purposed container would work well. 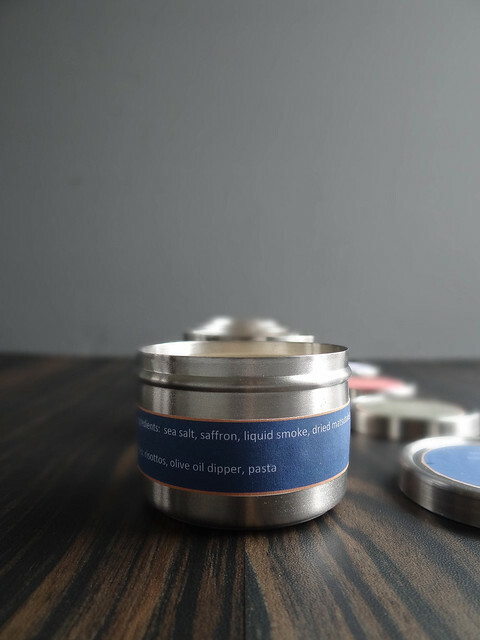 I bought these little storage containers here - they would make the perfect Hostess or Holiday gift. Place all ingredients for the salt you are making into a food processor or blender (I used my 2 cup mini food processor) and blend/process until all ingredients are incorporated together - you want to avoid any larger pieces of one single item. The Citrus Herb took the least amount of time processing, the Smoked Matsutake Saffron took the longest. Love this! I've been meaning to make flavored salts for a while now... I have a bunch of fluer de sel that would be perfect for flavoring! That Pow salt sounds especially enticing... you had me at "sprinkled over dark chocolate" - haha! Thank you for stopping by :) I will be emailing the label template out this weekend. 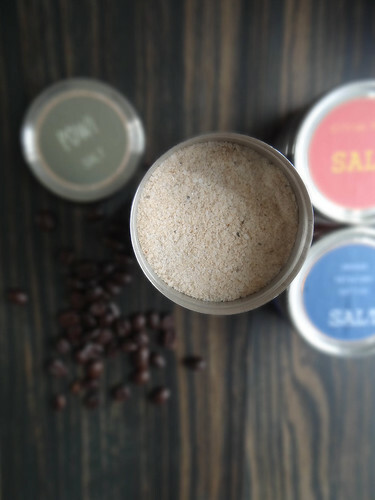 I love that you are having a DIY Holiday- that is my goal this year too :) The Salts will last forever, the flavor may start to diminish after a year. these are amazing! i've never even seen, used, or purchased flavored salts! i need to get into the loop and make these as soon as possible! what an amazing homemade gift to give! where do you purchase dried mushrooms and dried jalapeno? I WANT them all! So fabulous Heather! What a great idea! 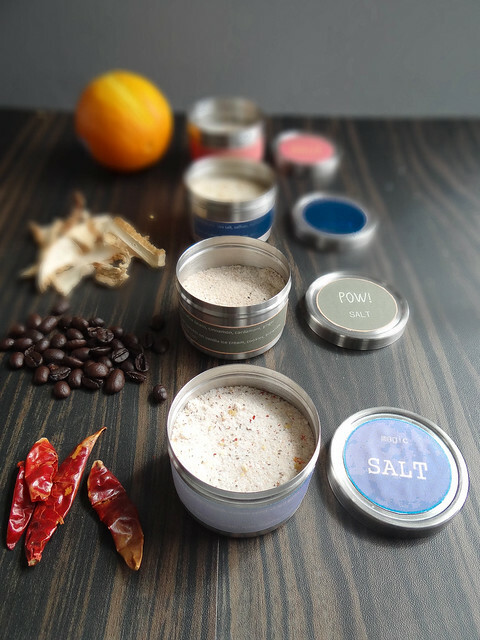 I think I'll try the pow salt next week because I plan on making my own chocolate. Thank you for sharing. I would love to have the template as well! Hi!! Sorry to have been so absent lately. Glad to see you're doing well:) I've never used finishing salt before, but you've inspired me to give it a try! Obsessed with this! Definitely going to be my next project! What a good idea for a kitchen project! I don't use a lot of salt myself, but I do like herbamare because it has other seasonings added to make it a bit more interesting! I like how you gave suggestions for ways to use each variation too...the magic salt would definitely be perfect for popcorn, and the citrus one would brighten up spring produce. I am loving this DIY series! I love flavored salts, especially Citrus Herb. A friend made me some before and I'm almost out. Now I have a recipe to make my own! i am loving this diy series asnd all those cute labels and jars! that magic salt is so versatile. it can be used with everything. This is an awesome post...thanks so much for sharing!!! Nice packing and really so awesome information. Like it.